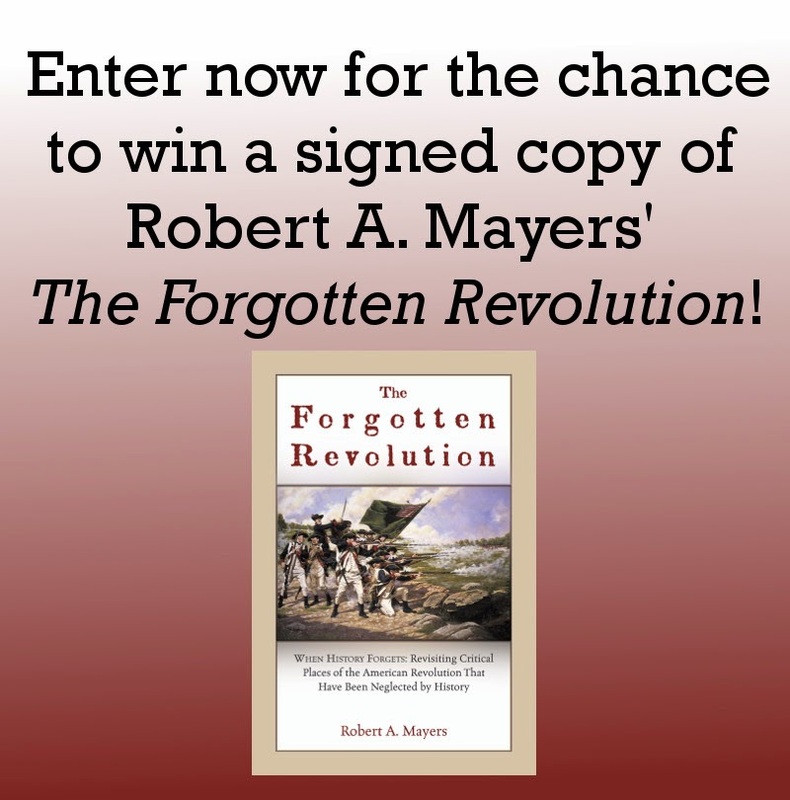 "The Forgotten Revolution" May 2015 Giveaway ~ The History Girl! Thanks to author Robert A. Mayers, The History Girl is offering a signed copy of his book The Forgotten Revolution. In order to be in the running, submit your name and e-mail address below! The Forgotten Revolution depicts battlefields, encampments, and sites of many critical events of the American Revolution that have been lost or neglected by history. Man-made changes to terrain have been enormous since that time and this work revives these forsaken locations with fresh research from original military records and onsite visits. The author's onsite visits to battlefields, encampments, and places of many critical events of the Revolutionary War shed light on revered places where patriots fought and died but are unmarked, shrouded in mystery, distorted by mythology, and unknown even to local people. Bob Mayers' quest for these sites took many unexpected turns. Analysis of obscure sources ignored by earlier writers yielded many surprises and unknown details were revealed at well-known sites. He made detours outside of known boundaries and textbook timelines and found that myths were often created when the winner wrote the history. Little known British, Hessian, and Loyalist accounts often reveal more than the details we have traditionally accepted as authentic. At each of the places he sought out "witnesses," people with special local knowledge. They were staff at national and state parks, regimental re-enactors, members of historical societies, private owners who live on the land, and descendants of original settlers whose ancestors are buried in local cemeteries. All have become caretakers of local history and they provided him with special insights and information that cannot be found in recorded history. Rules *One entry per person. *Valid for all residents of the 50 United States of America, 13 years of age or older. *Entries without a valid e-mail address are not eligible. *Contest begins May 10, 2015 at 6:00 pm EST and ends May 16, 2015 at 8:00 pm EST. *The winner will be chosen at random. *The winner will be notified via e-mail on May 16, 2015 after 8:00 pm. The winner must respond with a mailing address within thirty-six (36) hours or another winner will be chosen.